019. ERNEST H. SHACKLETON. Issued by Nicolas Sarony and Co. (1923). It is card number 100 from a second set of 50 large cards entitled "Celebrities and their Autographs". The card was included as a premium in a packet of 10 'Sarony' cigarettes. This is an original card issued in the year stated. Size: ca. 2.85" x 1.5". Recto: Photograph of Shackleton, his signature appearing below. Verso: No. 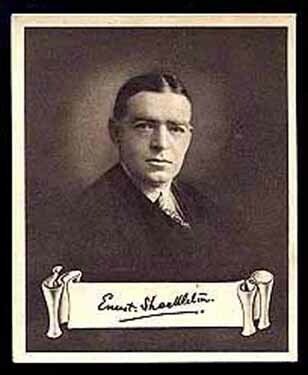 100 | Celebrities | and their | Autographs | Sir Ernest Shackleton | From a portrait in the possession of Lady Shackleton | His signature is takcn from a document in private possession. Antarctic Explorer. Born at Kilkea, Ireland. February 15th, 1874. Educated at Dulwich College. In 1901 acted as Lieutenant to the National Antarctic Expedition in the "Discovery" under Captain Scott. Appointed Secretary to the Royal Scottish Geographical Society, 1903, and headed ihe British Antarctic Expedition, 1907; locating South Magnetic Pole and making the first ascent of Mount Erebus, reaching a point one hundred miles from the South Pole. Knighted 1909 and made C.V.O., and again headed an Antarctic Expedition 1914-1917. Government mission to South American Republics 1917-1918. Mentioned in dispatches—O.B.E. (Mil.) for services with North Russian Expeditionary Force 1918-19. Commanded the Shackleton-Rowett Expedition. 1921, but died on board the "Quest" off South Georgia, January 5th, 1922. | NICOLAS SARONY & CO. | Cigarette Specialists | New Bond St., LONDON, W.
Note: There's another version of this which has the number (100) at the bottom of the card in an oval and is larger in size (3.1" x 2.5"). Note: Verso information courtesy of Evan Jones, Wiltshire, England.